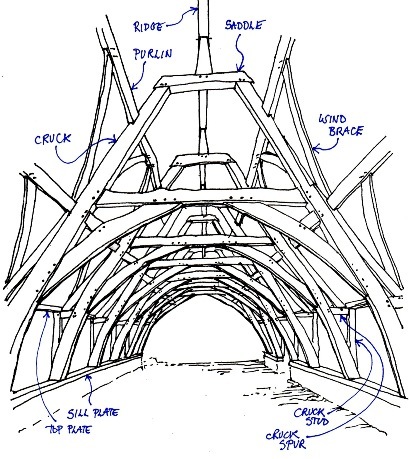 Traditional green oak framing techniques allow an almost infinite variety of designs. 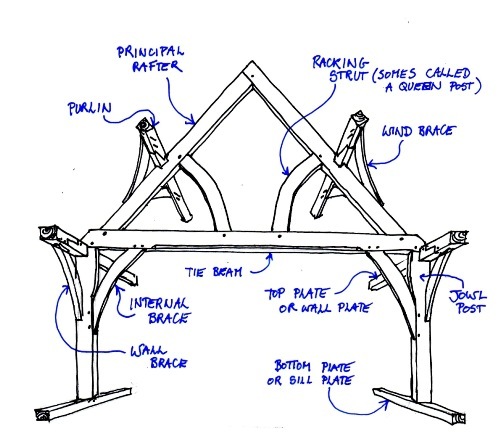 The different timbers and joints of a frame are like the words and the grammar of a language, and the framer, architect and client try between them to make sentences and paragraphs. Sometimes they create poetry and sometimes doggerel! But always they can choose to be more or less creative, and so through history a bewildering array of possible configurations have been tried. There are some standard classics though which have become very widespread. These would be folk songs in the metaphor above, they are passed from place to place and constantly added-to or embellished, changing with each carpenters interpretation. 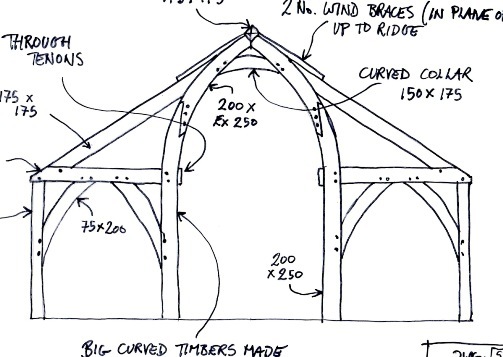 A little further down the page are some sketches of favorite frame types, but they should be regarded as starting points, inspiration for client and architect which the framer can then develop into fully formed designs. 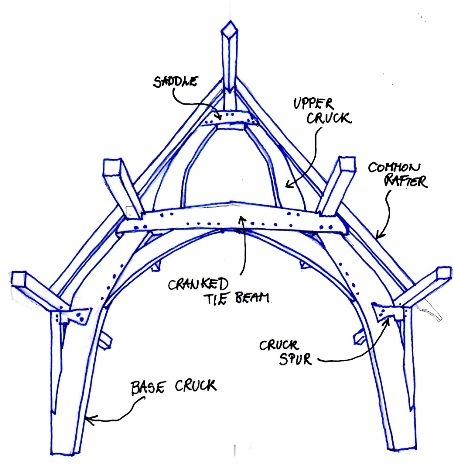 The word "frame" is a little confusing in that it is used to describe the whole structure of a timber framed house, and also the various flat sections and elevations which make up the house frame. 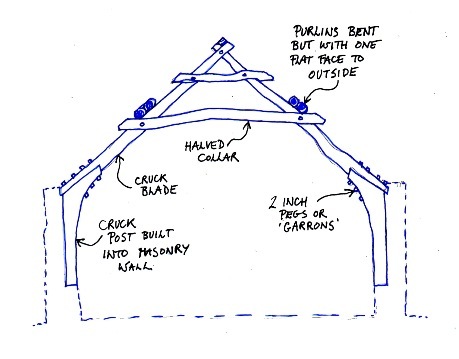 The usual suspects are: The 'wall frame' (side elevation). 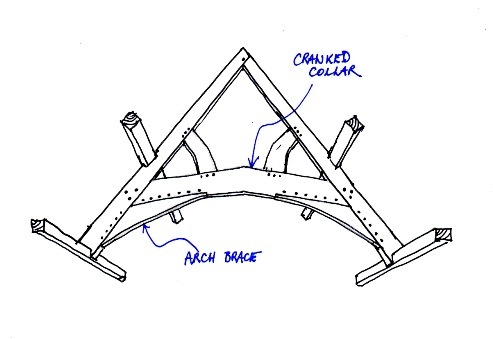 The 'cross frame' which is oriented perpendicular to the roof line, like a gable or an internal section of the building. 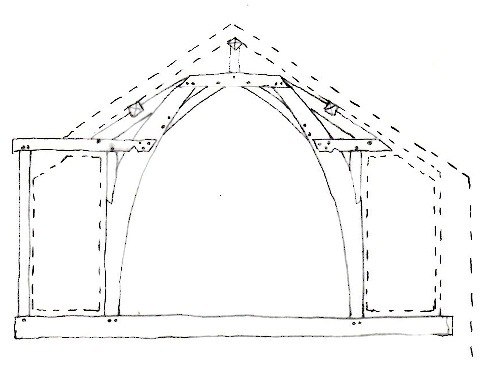 The 'roof frame' (in the plane of the roof). 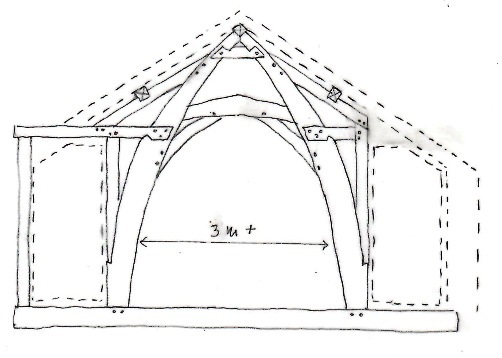 The 'floor frame' (in plan at floor level). 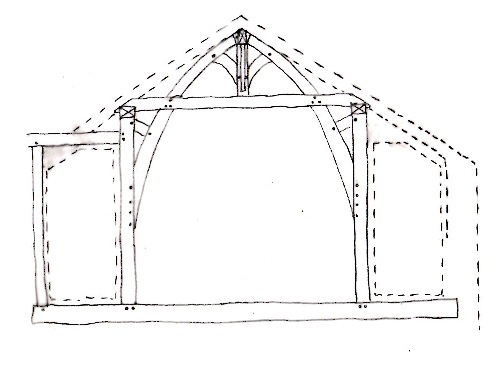 The drawings below predominantly show cross frames because this is the element which is most variable and therefore the most open to originality. 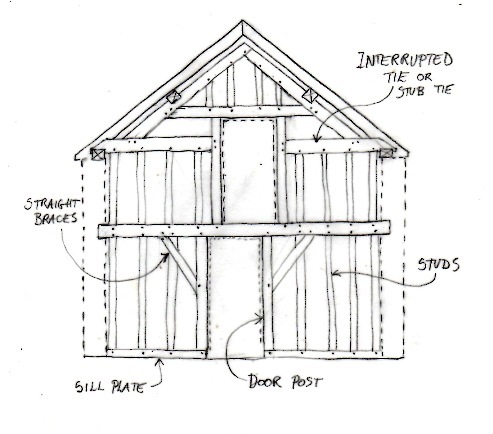 Some are structurally better suited than others, to particular situations. 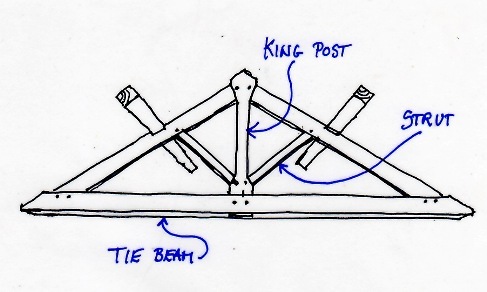 There are some notes about this and other things such as maximum clear spans under the pictures when enlarged. 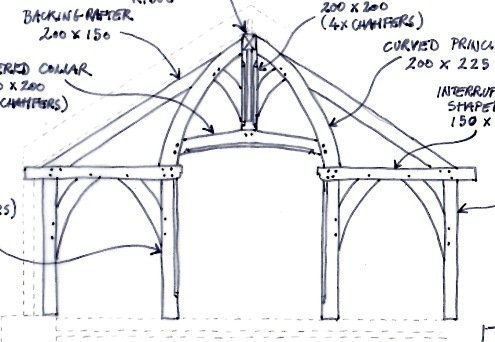 The spans are what one might reasonably expect in a normal situation. 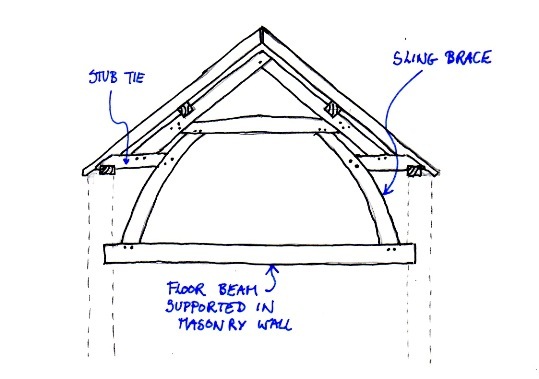 With addition of other timbers or steel brackets etc. 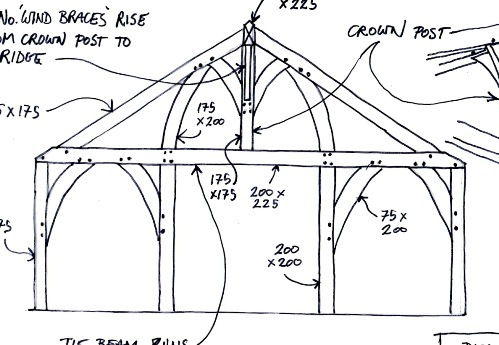 it may be possible to exceed these spans but it would probably start to get quite expensive. 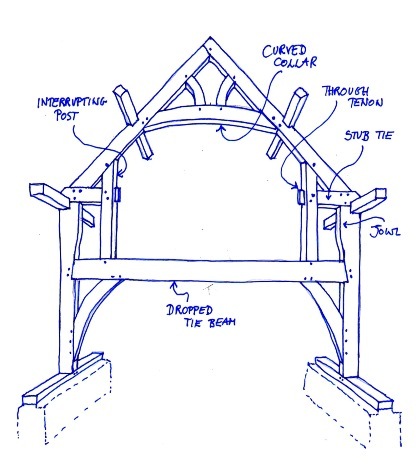 The fantastic variation on a theme that is possible, is illustrated in the drawings below, which were all designs for the same single cross frame in the same location. 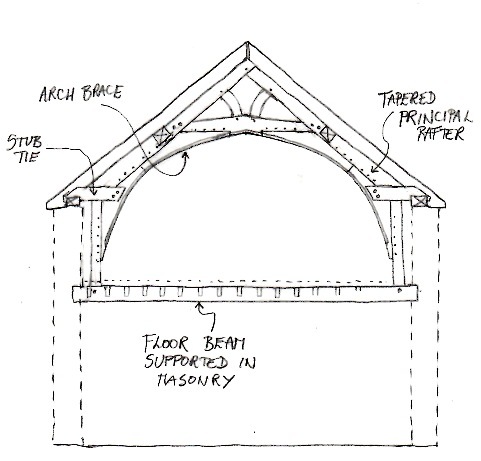 The remit was for some large curves to be incorporated into the design, and for these curved sections to highlight a central opening in the wall not far behind (not shown). 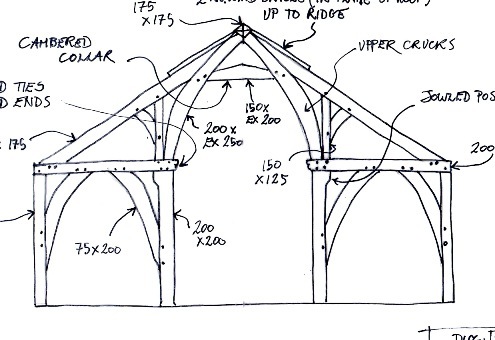 The drawings show options which were proposed on three separate occasions after discussion with client architect and engineer. 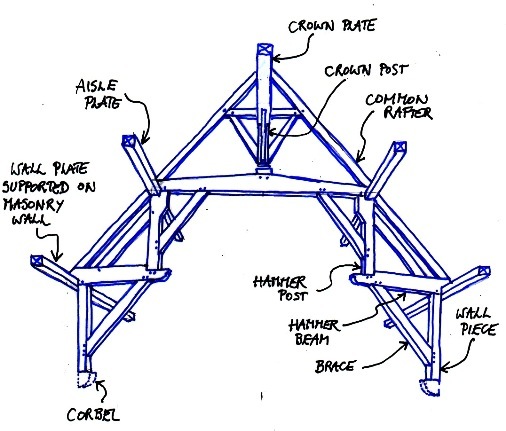 The final results are unconventional solutions which have grown out of the particular circumstances that were presented, the last one being I think particularly elegant.